EPSU will be involved in activities in relation to the 2nd European Action Day against the impacts of privatisation, marketisation and commercialisation of health and social care on the workforce in the sector, on the patients/users/citizens and on our societies. 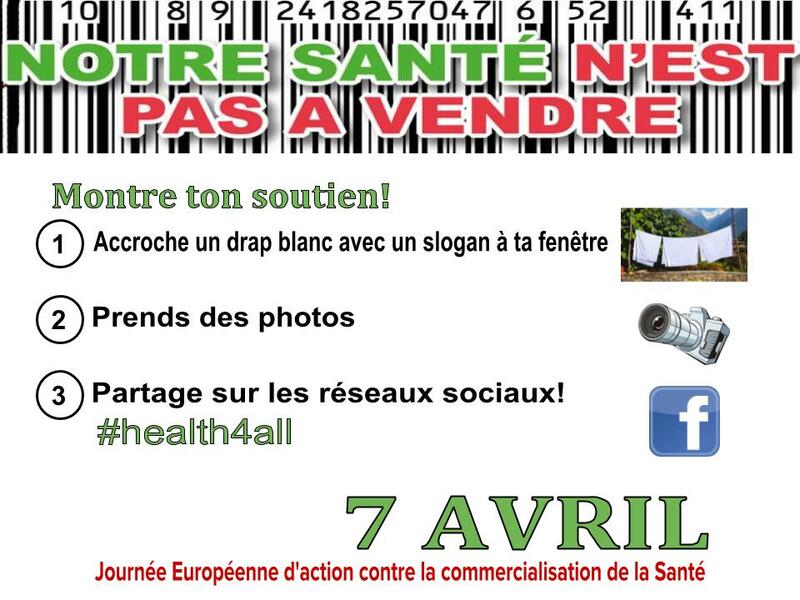 The European Action Day coincides with World Health Day (7 April). The EPSU’s Executive Committee meeting on 7 April 2016 will be followed by a public event. EPSU is organising this round table with the Belgian unions and other organisations fighting against the marketisation and commercialisation of health and other care and for the human right to health care. All Members of the Executive Committee and especially those organising workers in health and social care sectors are invited to participate. The meeting will take place straight after the Executive Committee at 14h00 (in the Auditorium at the ITUH, Boulevard Albert II, 5, 1210 Brussels. We will be able to provide active interpretation for EN, FR and NL. The invitation to attend this Round Table is in particular targeted to the colleagues attending the EPSU Executive Committee on 6 and 7 April 2017 and representing trade unions organising in health and social services. Jan Willem Goudriaan some weeks ago already circulated a short information and invitation. But it also is addressed to all other EPSU affiliates, in particular to those from the neighbouring countries The Netherlands, Germany, France and UK, to send a colleague to Brussels for the Round Table (see draft agenda as of 4 April 2017, in EN only). EPSU, however, would not be able to financially support any related cost of travel or accomodation. The main idea for this event is to provide evidence, from a trade union perspective, on the effects of privatisation, marketisation and commercialisation of health and social care on the workforce in the sector and on policy reforms and their impact on the organisation, provision, funding and quality of health and social services. But also to go beyond the description of the developments and to highlight what your trade union (alone, in cooperation with other trade unions and/or in coalitions with other civil society organisations) has undertaken in the last years and months to protest, to resist, to fight against policies and decisions having a negative impact on the working and pay conditions, on the health and safety at the workplace, on staffing levels (including staff cuts and unemployment), on workloads and stress etc., on the budgets available for health and social services, on the increased share of private/out-of-pocket payments for health for patients/users, on (financial and other) barriers to access health care, on longer waiting lists, etc. If you are interested and available to make a short (5 to 8 minutes) input, please inform Mathias Maucher (mmaucher@epsu.org). You can speak in EN, FR and NL. We are currently putting together a programme. We are also aiming at a meeting with cabinet members of competent EU Commissioners during the day. It seems we will have a meeting with a member of the Cabinet Moscovici, most probably on 26 April 2017. Please click on the links of the three articles to recall the activities done last year on and around 7 April at the occasion of the 1st European Action Day in 2016: The first article contains the call to participation/action from last year as well as the manifesto and also gives access to the photo gallery. The second article covers the mediatised action and the seminar organised. The third article documents the actions done by EPSU affiliates across Europe. We have also uploaded below the 2016 Call to Action (in EN, FR and NL). All EPSU affiliates are asked to help us to collect information on developments in your country with regard to privatisation, marketisation and commercialisation of health and social care in their country and in particular on the impacts this has on the workers in our sectors. 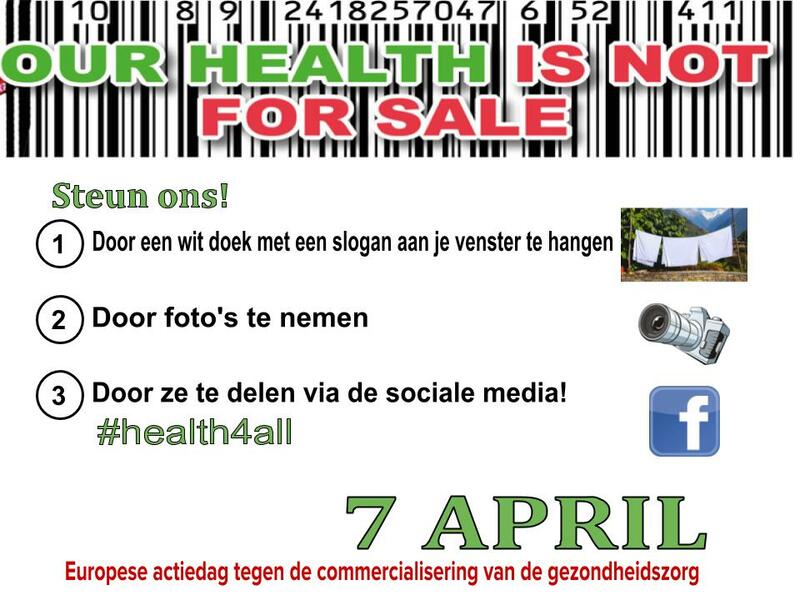 You are kindly asked to fill in information via the webpage http://www.health-is-not-for-sale.org/ set up some time ago and revised last year. This was done to facilitate the input of information – this can be done in English and in your own language – directly from a trade union/workers’ perspective (and also from the perspectives of citizes/patients/users), in addition to input on shifts in policy, the organisation, provision and funding of health and social services. We have uploaded to page the users’ guide in EN and FR. EPSU and its affiliates took part in a series of activities in support of the 2nd European Action Day against privatisation, marketisation and commercialisation within the health and social care sectors.